Inspired by similar challenges I 'm issuing a Delorme Challenge to Nebraska Cachers. THE HONOR ROLE: These cachers have completed the Challenge: Dates are those of the online log although the cache requirements usually have been completed and verified earlier. To log this cache you must find OR place a cache located within the area shown on each and every map page of the Nebraska Delorme Atlas. All caches placed must meet the usual standards for approval and maintenance. Most of you already have a copy of this resource. It's widely available at bookstores and truck stops. Libraries also have copies. At the time this cache was submitted there were NO currently active caches for four of the Delorme pages: numbers 23, 35, 45, and 72 but thanks to the efforts of the first cacher to log this and several others in the more remote parts of our state we now have at least two caches on every page of the atlas. The logbook for the cache is in a container located at the coordinates given above. When you have completed the challenge send me your list of caches with cache name,waypoint and coordinates. or use one of the checker s now available. 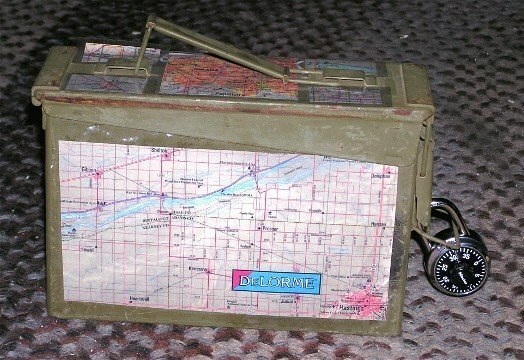 The Nebraska Delorme Challenge checker is now available on the Project Geocaching Challenge cache checker site ( http://project-gc.com/Challenges/GCR57E/17038) This site produces a map with a cache find identified for each Delorme page. The My Caching Profile website ( http://www.mygeocachingprofile.com/account/myprofile.aspx) now includes a list of caches for each page in the Delorme Challenge Progress section. Both of these are very easy for me to check and also useful for tracking your progress on completing the cache, Otherwise the easiest format for me to check is a GPX file picked from a My Finds pocket query. Put in GSAK, this will show that your logs are there. But I can work from a bookmark list, an excel spreadsheet or just a page by page list. After I have checked and verified it you are authorized to sign the logbook and log a find online. However, since this is a challenge cache you may do a provisional log in the book when you are in the Lincoln area and then do your online log after you have finished the challenge and I have verified your list. Those of you who really love traveling about our beautiful state may continue to do the challenge over and over, logging the cache each time you submit a whole new list of caches, all 65 of them found after the date of your previous log of the challenge. I am giving this a difficulty rating of 4 and, the terrain rating is 2 but for some of those pages it's higher than that. All caches must be caches with a container and a logbook. Virtuals,locationless, webcams, events, will not count. There are 65 map pages in the Nebraska Delorme Atlas, numbered 15 through 79. The maps overlap and some caches are in places shown on two different pages. Caches so located may be counted for either page, your choice, but only for ONE of the pages. If you are using the GSAK macro for mapping your finds be aware that it is based on the blue lines you see at the edges of the Delorme pages. This omits the overlaps and it will place a cache on only one of the pages. Also the blue line omits a tiny bit of Nebraska on the page 56 maps and the page 79 map. Page 68 has two separate maps for sections of Nebraska at opposite ends of the state: the Nebraska City/Plattsmouth strip in the east and the far southwest corner of the state in Dundy and Chase Counties. You must log a cache in the eastern Nebraska section shown at the left of the page but I decided to allow the western Nebraska portion, at the right of the page, to be treated as part of page 69. Page 56 has three strip maps for adjacent areas along the southern edge of the panhandle. You may consider these to be one map and log a cache in ANY of the three. The insert at the upper right of page 27 is considered a part of page 27. The insert at the upper right of page 55 is considered a part of page 55. If a Delorme page shows a portion of another state only caches within Nebraska count. 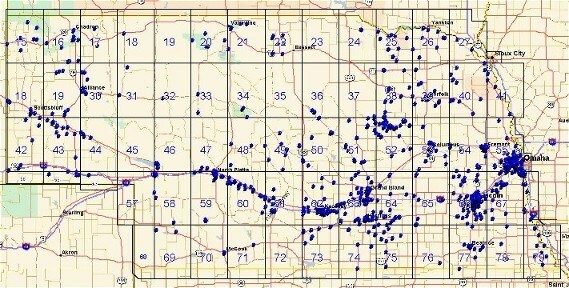 My thanks to byonke, who has provided this map of Nebraska caches with a Delorme grid overlay. When in doubt about anything ask me. If you are working on either level of this and wish to submit partial lists as you go along I will be glad to check your progress and you are welcome to post notes about this. I hope this challenge produces some new caches in the more remote parts of Nebraska and gets more of you out to explore our beautiful state. Have Fun! The cache containerHere's the cache container all decorated and waiting for you.